Business hours: Daily, 8.30am to 10.00pm. LOOKING for a place with the perfect ambience to break fast during Ramadan can be quite a task, especially when you are bored with the similar dishes offered at most outlets. If you happen to be at Suria KLCC, try Harrods World Signature Shop and Tea Salon?s Ramadan semi-buffet themed ?Chef?s Sunset Special? for a delightful fine dining experience. Executive chef Tony Cham, who has 20 years of experience in the culinary industry, has prepared about 80 dishes which will be rotated on a daily basis. Diners get to select the main courses while soups. appetisers and desserts are presented buffet style. For appetisers, try the Mediterranean Salad, which is a mix of greens, cherry tomatoes, black olives, potatoes, red radish and prawns. The Honey Date Fritters are a new appetiser at Harrods. Here, the imported dates are deep fried with batter mixed with soda water. For those who are fasting, this would be a perfect start to break fast. The dates are exceptionally sweet and large, and were a favourite among members of the media. Meanwhile, I got to try out three of Cham?s daily main course selections. The Chicken Breast with Ziren Sauce and Briyani Rice leaves you wanting more. The chicken was deboned and baked with star anise-flavoured chicken juice, making the dish aromatic. The addition of purple potatoes, carrots and zucchini was not only tasty but also added colour to the dish. If fish is your preference, the Pan Seared Cod Fillet with Chive Cream Sauce is a lovely Mediterranean dish. The fillet is lightly fried with olive oil while the sauce is different from the ones I have tasted before. It is a little sweet and nice when eaten with the fish. Where pasta is concerned, Harrods? offers the Prawns Pasta Olio with Garlic Bread. The linguine was al dente and tossed with chilli flakes, spices and large tiger prawns. A vegetarian version of the dish is available upon request. Other main course dishes include Harrods Roast Beef with Yorkshire Pudding (served with garden vegetables and roasted potatoes) and Lamb Shank with Herbs (served with assorted vegetables). Desserts are a must-try. The Diplomat Pudding, consist of a mix of cake crumbs, sponge cake, bread and butter pudding as well as raisins served with vanilla sauce. 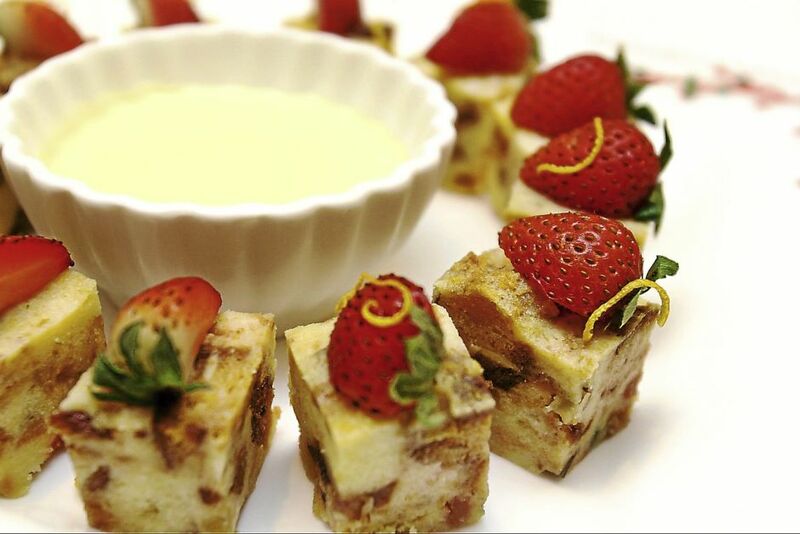 Unlike the conventional bread and butter pudding, the Diplomat Pudding is not as sweet. The Mixed Fruit Sabayon, on the other hand, is a concoction of whipped cream, sugar and egg yolk with fresh strawberries, kiwi and blueberry compote. I have developed a taste for the Orange Roulade. Cham used orange flavoured Swiss rolls mixed with orange cream and Harrods imported marmalade. There is a slight bitterness which comes from the marmalade. Nevertheless, thumbs-up to Cham for this creation. Assorted Malay kuih and fresh tropical fruits will also be served at the buffet spread. As for beverages, guests can enjoy Harrods teh tarik with or without ginger, sirap bandung, sugar cane, soya bean, flavoured iced tea, as well as mango and orange juices. Two types of beverages will be available on a daily basis, plus the teh tarik. The Chef?s Sunset Special is available till Aug 2 at RM98++ per person. A la carte dishes are not available during this period. Harrods is offering a promotion whereby a 50% discount will be given to the fifth guest for every mininum order for four persons. Meanwhile, for those coming in groups of nine, the 10th person gets to eat for free.